Youth Media Award season is a heady time for Librarians in Youth Services. We’re all trying to figure out what the best book will be, while waging our own mental campaigns for our favorites by thinking very compelling arguments at the selection committee. Like the Oscars, we wait all year to find out which books will gain top honors. The heavy hitters (like Best Picture, Best Actress, and Best Actor) are the Printz, the Newbery and the Caldecott Awards. The Printz is the top honor for literature written for teens while the Newbery is the equivalent for children’s. The Caldecott is awarded to books for children (usually picture books) with the best illustrations. You’re probably wondering, well this is great, but why should I care? BECAUSE THEY ARE REALLY GREAT BOOKS, PEOPLE! And, especially this year, I think they signal a shift in the library and publishing community. 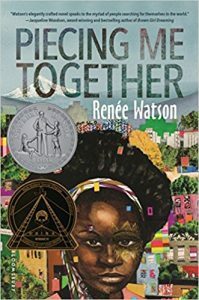 Almost all of the books awarded top honors this year represented diverse voices and stories, clearly peeling away from representation of only those in the majority. 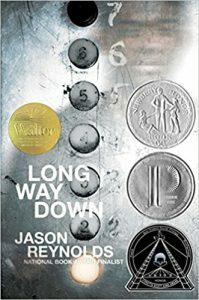 No place is this more apparent than in the medalist and honorees for the Newbery for 2018. Before we get into the amazingness that was the Newbery this year, a few notes on how books are judged: they have to be written in English by authors who spend the majority of time in the United States; there is one truly distinguished book but honor books can be named; it must be original, and it must be “the most distinguished contribution to American literature for children” published in the preceding year. 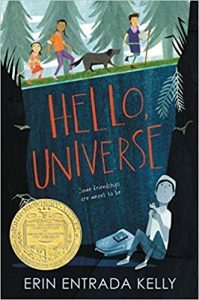 Now that we have that out the way, the winner of this year’s Newbery Medal is Hello, Universe, written by Erin Entrada Kelly. 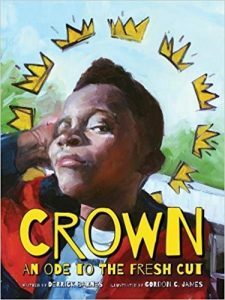 The honor titles are: Crown: An Ode to the Fresh Cut, written by Derrick Barnes, illustrated by Gordon C. James; Long Way Down, written by Jason Reynolds; and Piecing Me Together, written by Renée Watson. Look at these beautiful books, celebrating stories that haven’t traditionally been part of the “distinguished literature” cannon. Hello, Universe follows Virgil Salinas as he consults his friend Kaori, a bona fide psychic, for advice on how to make friends with the coolest girl at school, Valencia. Through a thoroughly believable, well woven plot and some “help” from a bully, Virgil and his guinea pig, Gulliver, end up at the bottom of a well. Convinced she can feel something wrong, Kaori and Valencia set out to rescue him. These four characters, the bully, the psychic, the brave girl, and the shy boy at the bottom of a well, are propelled towards each other. It culminates in a finale that I definitely saw coming, but couldn’t help grinning like an idiot over anyway. I cannot wait to put this book into the hands of everyone I meet. Well done Newbery Medal Committee, and well done Kelly Erin Entrada for producing a book to fall in love with.